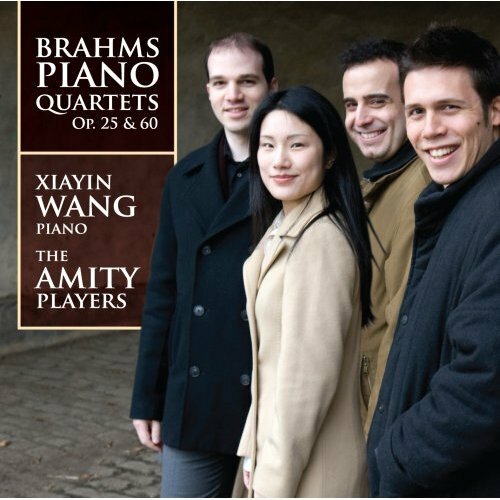 The young Amity Players collaborated with pianist Xiayin Wang on two of Brahms’ dramatic piano quartets, both conceived at times of personal tumult. He began the Piano Quartet in C Minor in the mid 1850s after his mentor, Robert Schumann, attempted suicide. His Piano Quartet No.1 in G minor was composed between 1857 and 1859, following Schumann’s death. Brahms had formed a close relationship with Schumann’s wife Clara that intensified after her husband’s death and was the subject of much speculation. Both quartets are informed by turbulent emotions, oscillating between anguished brooding and violent abandonment. In livelier movements, such as the G minor Rondo, the Player’s tempo and accent style detracts from the vigorous intensity that could electrify the composition. However, Wang sparkles with precision, solidifying and invigorating the quartet. Cellist Raphael Dubé plays expressively, with singing tone in the C minor Andante, and the group produces a thick, murky texture that beautifully darkens the G minor Andante con moto. Overall, the Amity Players and Xiayin Wang capture the dark and confused emotions that permeate the two compositions.